In the dark silence on the night of April 1st, the Vermont Brigade, with the rest of the Sixth Corps, filed between Forts Fisher and Welch, organized into a wedge-shaped formation on the ground recently captured, and prepared to charge the Confederate earthworks beyond. Each of the seven brigades stacked its regiments one behind the next in assault columns with the Vermonters holding the center position, the entire pattern guided by a ravine belonging to one of the many branches of Arthur’s Swamp which dissected the Confederate lines. At dawn of April 2, 1865, the Second Vermont followed right behind the Fifth Vermont and pierced the Confederate earthworks, the first break in the lines encapsulating the city of Petersburg. Plenty of work still remained to be done that day. 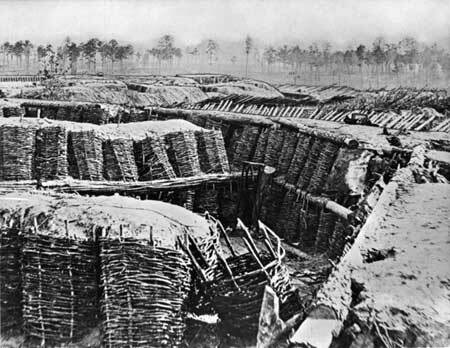 Union siege line at Petersburg. Lieutenant Charles H. Anson, just promoted that day to the staff of Brigadier General George W. Getty’s division, delivered messages through the barrage to the three brigade commanders. “To ride along the lines amid that terrible storm of shot and shell seemed an impossibility,” he recalled. Some units found partial cover lying beneath the crest of a ridge until additional Confederate batteries began their deadly work, including several on the north bank of the Appomattox. “The enemy poured in a very heavy fire of shot and shell from a battery on our right, which completely enfiladed our lines,” reported Captain Barber, “and a perfect hail-storm of canister from a battery of four guns planted in the garden of the Turnbull house… directly in front.” The rest of the exhausted Sixth Corps extended the line to the river and their own artillery began to deliver counter-battery fire. With the Confederate artillery positions south of the river overlapped, and Longstreet’s reinforcements still rushing to the inner line of works, beyond which the church spires of the city of Petersburg now stood visible in the distance, the Vermont Brigade began the last charge in their last battle of the war. This entry was posted in Battles, Campaigns, Common Soldier, Sieges and tagged 2nd Vermont Infantry, Cedar Creek, Charles C. Morey, Morey-series, Siege of Petersburg, Vermont Brigade. Bookmark the permalink.